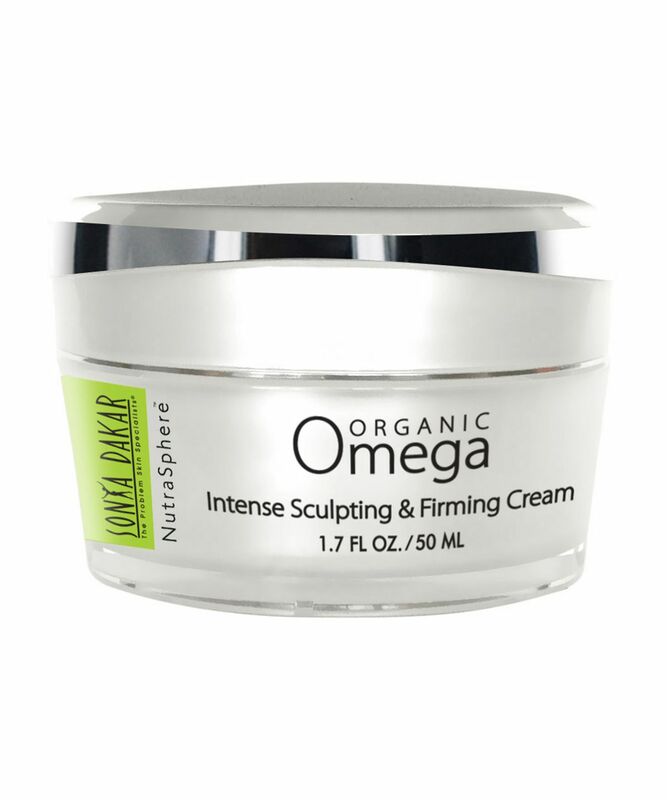 Intensely hydrating, Sonya Dakar’s Organic Omega Intense Sculpting and Firming Cream plumps, tightens, ‘lifts’ and deep-conditions drier, dehydrated and mature skin types with quick and cumulative effect. Enriched with a cocktail of powerful actives, this diminishes depth of fine lines and wrinkles, and re-defines facial contours to help counteract sagging (it’s ideal for jowls), so your skin becomes smooth, strong and supple. 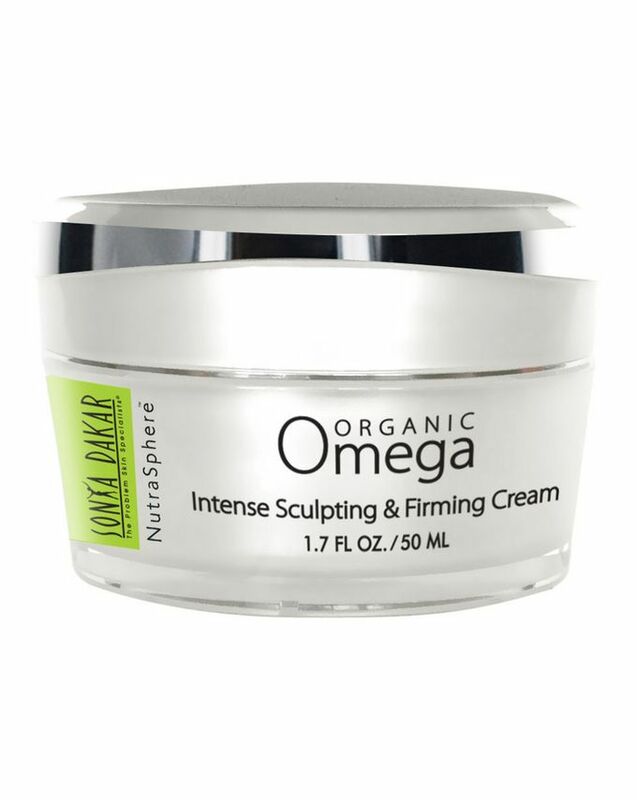 Starring a high concentration of omega oil – a potent source of fortifying and elasticising skin-essential fatty acids – Sonya Dakar’s Organic Omega Intense Sculpting and Firming Cream delivers visibly smoother, firmer skin in just three weeks. Corrective and protective, this contains a cocktail of free radical-scavenging antioxidants to ward against DNA damage, while a cocktail of five potent, age-defying actives combine to maintain hydration levels, stimulate collagen synthesis, increase density and enhance skin’s resilience – tautening slackened jawlines and diminishing under-eye bags – so you appear more ‘sculpted’ with an enviable, youthful luminosity. Morning and evening, apply all over clean face and neck. At night follow with the Organic Omega Overnight Sculpting Mask. Water/Aqua/Eau, LinumUsitatissimum (Flax) Seed Oil, Propanediol, Bentonite, Glyceryl Stearate, Glycerin, Capric/Caprylic Triglyceride, Cyclopentasiloxane, HydrolyzedYeast Extract, Titanium Dioxide, Alumina, Essentialoils, Polyglucuronic Acid, Cetyl Alcohol, Butylene Glycol, Pseudoalteromonas Ferment Extract, Polysorbate 20, Butyrospermum Parkii (Shea) Butter, PEG-150 Distearate, Phenoxyethanol, Simmondsia Chinensis (Jojoba) Seed Oil, Lecithin, Avena Sativa (Oat) Kernel Extract, Leontopodium Alpinum Callus Culture Extract,Polyacrylamide, Xanthan Gum, Caprylyl Glycol, Mauritia Flexurosa(Buriti) Oil, PEG-75 Stearate, C13-14 Isoparaffin, Alanine, Cetyl Hydroxyethylcellulose, Proline, Serine, Ceteth-20, Ethylhexylglycerin, Hexylene Glycol, Steareth-20, Laureth 7, Carbomer, Sodium Hyaluronate, Ethylhexylglycerin, Sodium Hydroxide, Sodium Phosphate,Palmitoyl Oligopeptide, Palmitoyl Tetrapeptide-7. I got a travel size with the omega booster I bought and recently ordered it for myself because I really like it. It feels very soft and gentle on my sensitive, aging skin while I see that it gives my skin strength (e.g. skin under chin more tight - I'm in my fifties). Together with the omega booster and daily spf I'm growing into this brand as I see what it does for my skin. Happy! !